Father Confessor is Russel D McLean's third outing for Dundee-based private investigator J McNee, and the result is a superbly well told and compelling book that grabs you by the throat within the first few pages, and doesn't let you go until you've reached the climax. We've reviewed the two earlier books in the series, The Good Son and The Lost Sister and both were very good. 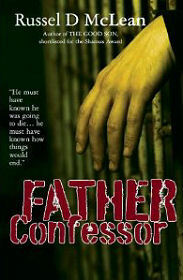 Father Confessor is even better. Russel D McLean has produced a polished and highly accomplished piece of crime fiction that has lost none of the grittiness and sense of place of its predecessors, yet somehow feels more rounded and complete. McNee's nemesis, Detective Inspector George Lindsay, the man whose nose McNee's was kicked out of the police force for breaking, is trying to find McNee's girlfriend Susan Bright, to let her know that her father, DCI Ernie Bright, has been killed in the line of duty. Susan is a detective sergeant who has been suspended from duty pending an investigation into the events at the conclusion of The Lost Sister. And now her father is dead. Still worse, the circumstances of his death raise suspicions Ernie Bright was corrupt, something McNee already feared. DCI Bright had been McNee's mentor before his dismissal from Tayside Police, and now McNee feels he owes it to Bright, and to his daughter, to find out who was responsible for the killing. And then leading Dundee gangster David Burns turns up in McNee's office offering to pay him handsomely to investigate the same killing. What really lies behind the links between DCI Bright and David Burns, and how much of what Burns is saying about the background to Bright's final investigation, the one that got him killed, can McNee believe? Suddenly the certainties of right and wrong begin to look less certain, and things become still more dangerous when the one man McNee feels, however reluctantly, he can trust, is removed from the picture in the most brutal manner possible. On the evidence of Father Confessor, there is a lot of mileage left yet in J McNee, and was that a hint of a slight change of future direction we picked up on the final page? We await his next outing with keen anticipation.